The area north of Trieste experienced great bloodshed at the time of World War I and the Second World War brought further political and ethnic divisions to this part of Europe - a meeting place of Germanic, Latin and Slav cultures. By entering this arena of ethnic and historical complexity, UWC Adriatic has embraced an educational role of highly-charged political meaning and stepped into a world of extraordinary cultural diversity. For these very reasons the regional government of Friuli Venezia Giulia and the Ministry of Foreign Affairs backed the project from the outset and remain the College’s main stakeholders. Immersive Italian Experience - Students experience a UWC education while being continuously exposed to the richness and diversity of Italy’s cultural heritage. The College capitalizes on its setting at a political, cultural a geographical crossroads in the heart of Europe. Music - Music plays a major role at UWC Adriatic thanks to the presence of a music academy (ICMA) that aims to explore the full range of musical genres and styles from around the world. A Village, not a Campus - UWC Adriatic is not enclosed in its own campus, rather its residences, academic building, laboratories, etc. are scattered throughout the village. Students are integrated into the lives of the local and surrounding communities through their daily life and weekly social services. UWC Adriatic offers the International Baccalaureate Diploma Program (IBDP) curriculum. Alongside standard courses, the College offers Arabic, Slovene, Serbian, Croatian and Bosnian, World Arts and Cultures, Environmental Systems, and Art. Additionally, all students are expected to take Italian as a subject, although this does not have to be an IBDP exam subject but can complete a separate Certificate. UWC Adriatic places a special emphasis on the "service" component of its Creativity, Activity, Services (CAS) program. Being physically integrated into the life of the local community the College has long-standing collaborative relations with many associations that lead volunteering activities in a wide range of areas. Social services activities include: work with Italian and Slovene speaking children through art, teaching English and other activities in local primary schools; multicultural presentations to offer a multicultural experience to students of local primary schools through a range of activities aimed at fighting prejudice and racism; assistance to persons with mental or physical disabilities; refugee work, offering companionship to the elderly or other persons who are confined to their homes; visiting the elderly in local institutions; First Aid Course - Ambulance Service (with local Red Cross operators); performing musical concerts in hospitals and institutions for elderly and sick people; visiting people with multiple sclerosis; engaging in sport and theatre activities with people with disabilities; science dissemination for children and adults; offering English conversation classes to the local community; visiting the residents of a local hospice. Creative activities include: Adriatic Times (blog), Ceramics / Pottery, Chess, Creative writing and Literature Appreciation, Current Affairs Study Group, Debate Club, Decoupage & Patchwork, Drawing, Exploring Cultures through Cinema, Model United Nations (MUN), Music activities (Choir, Madrigal Choir, Piano Lessons, Solo Singing, Understanding Courses, Music Composition, Instrumental Lessons, Ensembles, Musical Show), Photography, Robotics, Philosophy magazine, TEDx UWC Adriatic, Theatre, Yearbook, WEB 2.0. 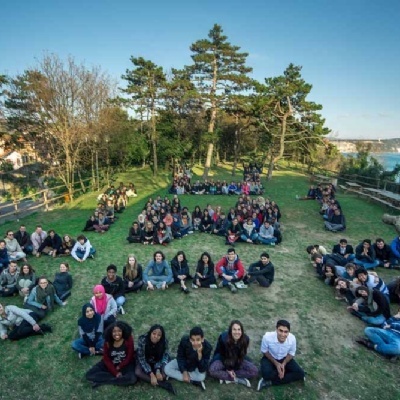 UWC Adriatic capitalizes on its seaside village setting on Trieste’s karst highlands and in the vicinity of the Alps to offer its students a range of related outdoor activities. The full range of options currently available are as follows: Aerobics, Badminton, Circuit Training, Climbing, Contemporary Dance, Cross country running, Hiking, Kayaking, Mixed Martial Arts, Orienteering, Sailing, Soccer, Swimming, Tennis, Ultimate Frisbee and Yoga. UWC Adriatic’s residences and facilities are scattered around the village of Duino. Seven residence buildings host the students. Other facilities include the Mensa (the canteen), the Academic Building, the Art Centre, the Science Labs, the Library, the Medical Centre, the Auditorium and ICMA – the International Community Music Academy. Duino, a charming seaside village half an hour from Trieste, is a tranquil location that provides a protected environment conducive to a healthy lifestyle. Venice is nearby and the border with Slovenia is just a few kilometres away. Collegio del Mondo Unito dell’Adriatico O.N.L.U.S.